The use of proxies is common place. Sometimes you will need to specify your proxy information in order to allow the action to continue. Registration process of 5dchart Add-In will attempt to automatically detect and load your machines proxy settings. If the setting cannot be detected, you will need to manually enter them. At any registration screens press Ctrl + F7. This will bring up a dialog to allow you to enter your specific information. If you need to find out your proxy information, you can do so from your Internet Explorer. Go to your Tools|Internet Options|Connections window. Here, you will find the option to bring up Settings where you will find your proxy data. After entering the serial number you will be offered the opportunity to activate your software. 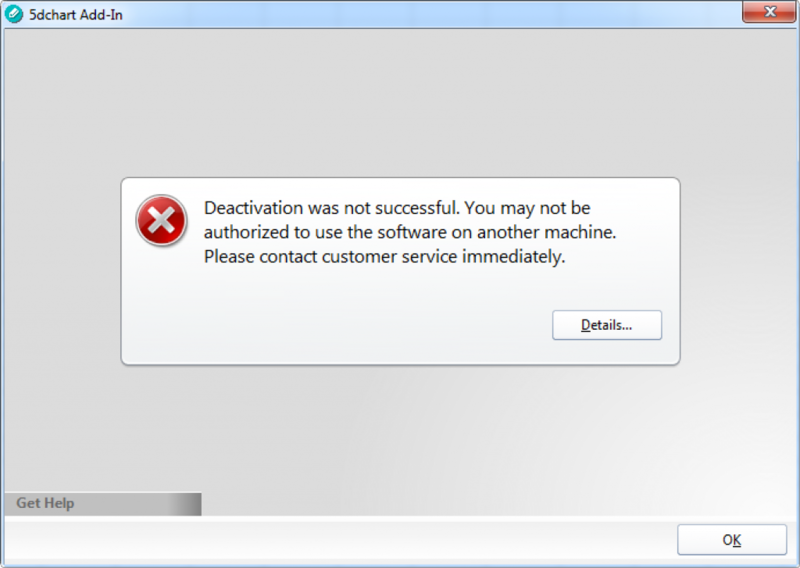 According to the EULA, you are able to use your copy of the software on two devices. If you want to stop using the 5dchart Add-In on your device, you should deactivate your copy. To do this please check your Internet connection and deactivate the copy by pressing the “Deactivate” button on the “Registration” menu found in the 5dchart section (please see the screenshot above). After deactivation, your current copy of 5dchart Add-In turns to evaluation state and you still can use it with some evaluation copy restrictions. If you get an error message (please see the screenshot below) it means that the online registration server is unavailable. Please check your Internet connection, activate and deactivate the copy again. If you don’t do that your copy could not be activated on the other device.